“See Yourself as Others See You” was created from a Styrofoam head that came from a local beauty supply store. The entire form is covered with small pieces of mirror. Doing one’s self-portrait requires a lot of self inspection. 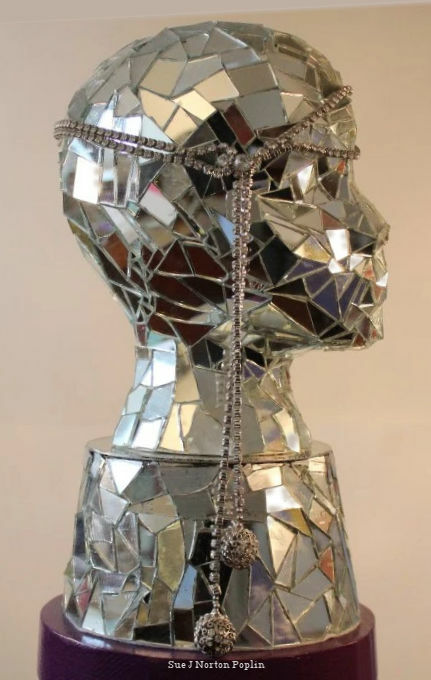 As I glued each small piece of mirror onto the head I could see parts of myself reflected in the mirror. This in turn caused me to reflect who I am as a human being. The rhinestone tie around the head represents the sparkle in my life.